Watch The Leonid Meteor Shower This Weekend Hopefully you don't have anything planned between late Saturday night and 3 a.m. Sunday, because with a clear calendar and clear skies, you should be able to catch a glimpse of a few meteors. 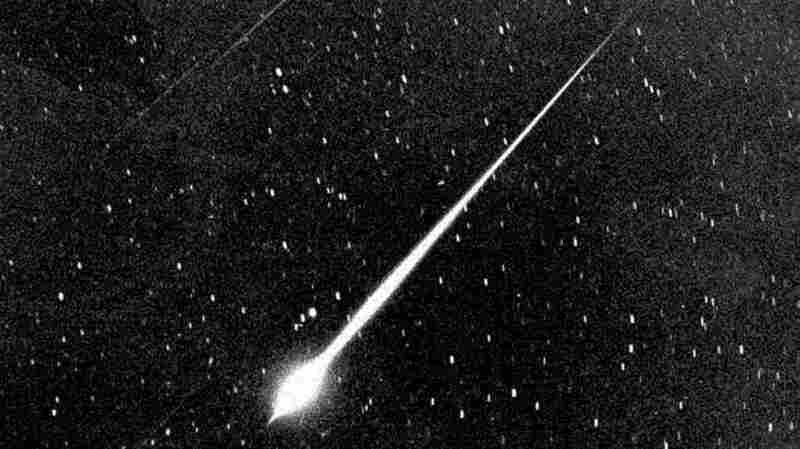 This bright meteor was seen in the sky above Wrightwood, Calif., during the Leonid meteor storm of 1966. Storms are more intense than showers, but every year Leonid meteors streak across the night sky in November. While some might say the weekend before Thanksgiving is too early for making a holiday wish, the Leonid meteor shower brings plenty of opportunities to do so every year around that time. Always occurring in mid-November, an average of about 15 meteors per hour streak across the night sky during the shower's yearly peak, according to NASA. "In less than 30 minutes in the dark, your eyes will adapt and you will begin to see meteors," the space agency writes. Also, observers should be patient and prepared to get cozy, bringing a sleeping bag, blanket or lawn chair. They should also check the weather — clouds can ruin the view, and being cold can ruin the experience. In the night sky, it will appear like the meteors are coming from the constellation Leo, which gives the shower its name. However, this is neither their origin nor the best part of the sky to look for them. "It is actually better to view the Leonids away from the radiant: They will appear longer and more spectacular from this perspective," NASA notes. The meteors themselves come from the comet 55P/Tempel-Tuttle, which completes an orbit around the sun every 33 years. When the comet passes the sun, a debris trail is created. The Earth then passes through the cloud of space dust every November. This process means that every 33 years or so viewers on Earth may experience a Leonid storm, which is much greater in intensity than a Leonid shower and can produce hundreds to thousands of meteors per hour. "These outbursts of meteor activity are best seen when the parent object, comet 55P/Tempel-Tuttle, is near perihelion (closest approach to the sun). Yet it is not the fresh material we see from the comet, but rather debris from earlier returns that also happen to be most dense at the same time," writes the American Meteor Society. One such outburst occurred in 1966, with thousands of meteors blazing across the sky during the course of 15 minutes. 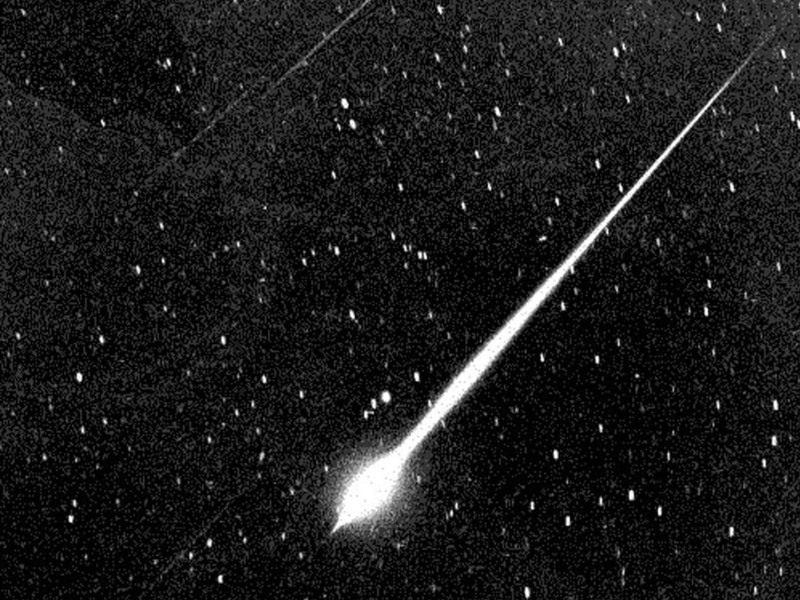 NASA hosts a webpage that compiles eyewitness accounts from that 1966 storm, and one of those eyewitnesses, Mike Jones, who was a cadet at Fort Wolters near Mineral Wells, Texas, at the time, says he observed dozens of meteors every second. "The 1966 Leonid storm will always remain a natural wonder I'll never forget, the night the sky rained fire!" Jones wrote.